The desalination industry, a critical source of potable water in many arid regions, generated more than $13 billion last year and is expected to double within a decade. Most desalination plants today use a process called reverse osmosis (RO), which forces water through huge rolls of membranes, leaving the salt behind. One of the most expensive operational challenges for such plants is the fouling of these membranes by microorganisms. Now, research from MIT suggests a different approach to reducing the rate of fouling and thus improving the efficiency of RO plants. The prevailing idea in the industry has been that the high pressure required by RO is responsible for the relatively high rate of fouling, compared to other systems such as forward osmosis. But the MIT study shows that this is not the case, a finding that opens up new approaches to reducing fouling in RO. The research, by Emily Tow '12, SM '14, PhD '17 and MIT Professor John H. Lienhard V, was recently published in the Journal of Membrane Science and presented at the 2017 AMTA/AWWA Membrane Technology Conference, where it received the Student Best Paper Award. Many experts believe that the high pressure in an RO system compresses the microbial mats that grow on the membranes, and that this "compaction" makes the growth much harder to remove. In contrast, in low-pressure forward osmosis (FO) systems, which are less energy-efficient but more fouling-resistant, the supposedly looser mat is thought to be easier to clean off. However, these microbial mats are generally full of water, which does not compress under RO pressures, so "there is no good reason why high pressure should worsen fouling," Tow says. She compares the microbes to a scuba diver: "There's a lot of pressure at the bottom of the ocean, but it doesn't make you stick to the seafloor." But if pressure doesn't matter, and the flow rates through FO and RO systems are similar, what could account for the disparity in fouling resistance? Tow, who is now an ITRI-Rosenfeld Postdoctoral Fellow at the Lawrence Berkeley National Laboratory and will be a professor of mechanical engineering at Olin College next year, devised a new approach to isolating the effects of pressure from those of other differences between FO and RO. 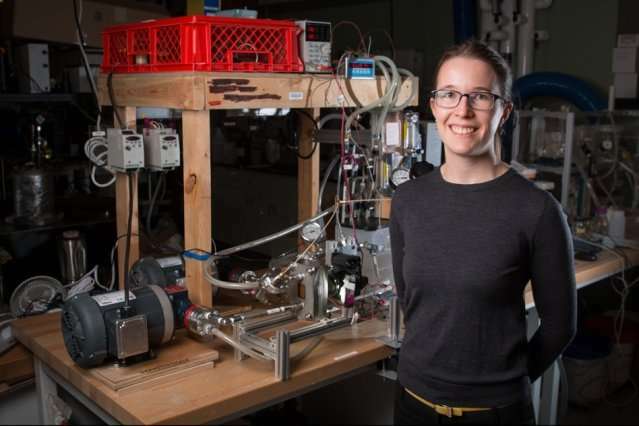 Her method involves operating an FO system, which uses osmosis to pull water through membranes, at a range of pressures up to 40 atmospheres. "We measured fouling rates and cleaning outcomes, and even recorded video of the membranes being cleaned at various pressures, and we found no effect of pressure," she says. Many highly cited papers claimed that pressure was the issue, but previous experiments also varied the concentration of the solution on the back side of the membrane when varying pressure. By raising the pressure on both sides of an FO system without changing anything else, the MIT study revealed that pressure alone does not exacerbate fouling or impede cleaning. Now that high pressure—which is essential for RO to work—is shown not to affect fouling, researchers should look for other reasons that processes like FO are more fouling-resistant and see if they can be applied to RO, Tow says. "The observation that forward osmosis membranes are easier to clean is fairly robust," says Lienhard, who is the Abdul Latif Jameel Professor of Water and Food and director of the Center for Clean Water and Clean Energy and of the Abdul Latif Jameel World Water and Food Security Lab. But the new study shows that FO's fouling resistance "is not intrinsic to its low pressure. The difference must be related to other factors that could potentially be transferrable to RO. It needs to be understood," he says. "The hope is that with further work, this could make it easier to clean RO membranes," he says. Currently, mitigating membrane fouling is a major part of non-energy operating expenses of an RO plant, which account for about a quarter of the cost of desalinated water. Any improvement in fouling resistance could significantly impact water cost. It's possible that the difference in how fouling affects RO and FO membranes has to do with the membrane's support layer, which is the backing on the thin, salt-filtering layer. In FO, interactions between the support layer and the concentrated solution it touches influence the pattern of water flow through the membrane, which dictates the way foulants build up on the membrane surface, Tow says. Future RO membranes could be designed so that fouling occurs in a pattern similar to that of FO, or even a new pattern optimized for easy cleaning. Improving the ability to clean used membranes could affect not only water cost but also the reliability of desalination plants, Lienhard points out. "Shutdowns because of an algal bloom can sometimes intererupt the supply of water for days or weeks on end," he says. Understanding the fundamentals of fouling, including the effect of pressure, enables development of more targeted fouling mitigation methods. This research "debunks the broadly held belief that pressure causes or complicates fouling in reverse osmosis systems, and the corresponding belief that lack of pressure reduces fouling in forward osmosis systems," says Richard L. Stover, director of the International Desalination Association, who was not involved in this work. The new study, he says, "identifies assumptions that biased or limited the interpretation of test data in [earlier] studies and contributes new experimental data that clearly and definitively prove its thesis." 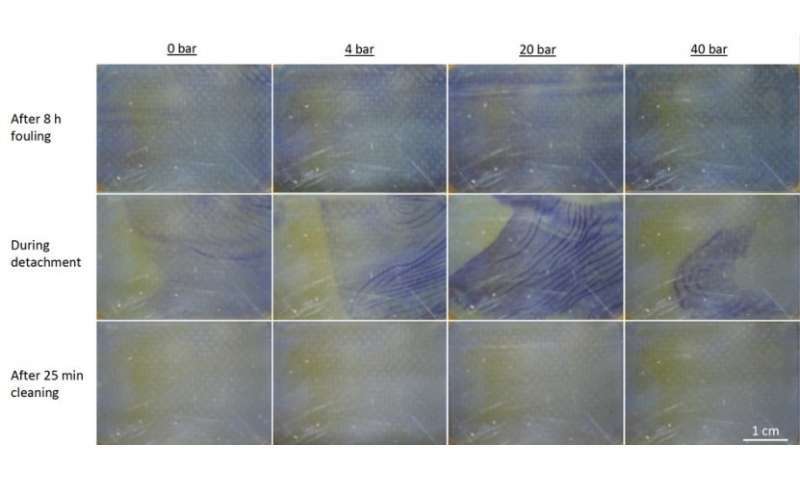 The new mechanisms the researchers propose "qualitatively explain the fouling resistance observed in FO systems, providing clear direction and outstanding context for future research," Stover says. "Overall, the paper represents a significant contribution to the broader understanding of membrane fouling mechanisms and their possible abatement. Simply put, it is a fine piece of work."